The Environmental Chemistry students have collected spectral data on the soils at the California Shakespeare Way Exit on Highway 24 median. The triangular property is sufficiently large that a team of students can establish a sampling grid to measure the lead content in the soil relative to the highway as the source of the pollutant. The Niton 796 XLt instrument was used to record the lead content in surface soil samples over many years. The site has had only minor disturbances since 2003 when the sampling began. Notes Site was not previously sampled. Spectra were recorded in plastic bags after drying. Site was disturbed Summer 2003 by auto wreck near middle of site. Sampling at the far western end was the focus as well as one far eastern location as reference. At a 95 % confience limit, the two mean values for Spring 2003 and Fall 2006 data collected at 15 ft perpendicular to the highway are the same (i.e. the differences are within the range predicted for random error). At a 95 % confience limit, the two mean values for Spring 2003 and Fall 2004 data collected at 15 ft perpendicular to the highway are not the same (i.e. the differences are notwithin the range predicted for random error). This determination supports that the auto fire and the removal of the wreck lowered the soil lead values on a portion of the site that was sampled. At a 95 % confience limit, the mean values for all data collected at 30 ft perpendicular to the highway are the same (i.e. the differences are within the range predicted for random error). This provides more evidence that the auto fire and auto wreck clean up only affected the location closest to the highway. 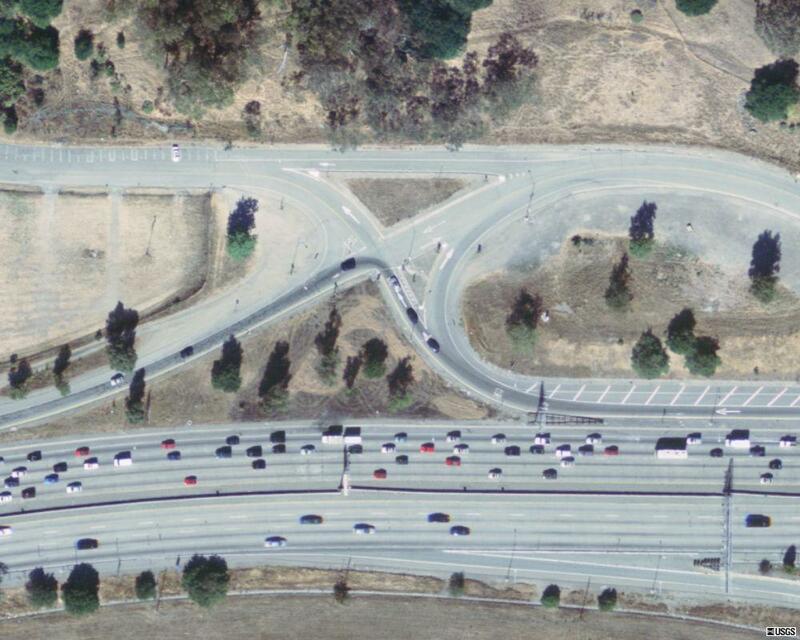 The California highway 24 field training site is located at the Shakespeare Way and Wilder Road interchange. The image above was downloaded from Google Earth in 2004.